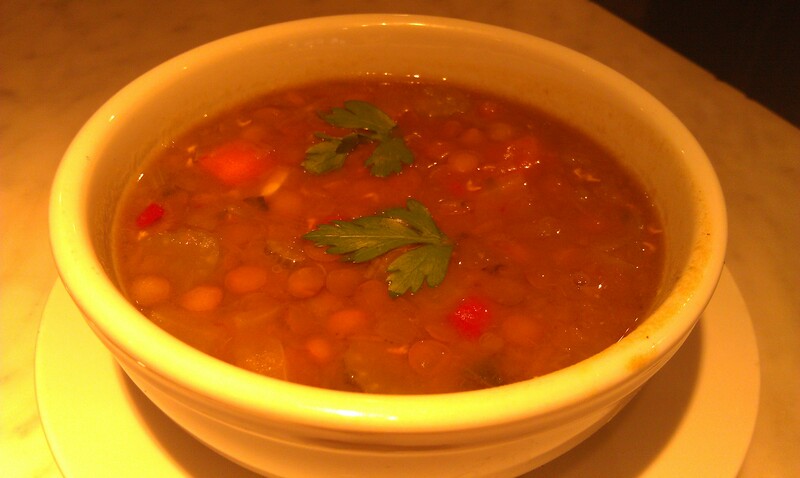 Plenty of protein and a great vegetarian option, this lentil soup is not only bursting with flavor but definitely filling. Invite some friends over to try it–this recipe serves 6! Place the olive oil into a large 6-quart Dutch oven and set over medium heat. Once hot, add the garlic, onion, carrot, celery and salt and sweat until the onions are translucent, approximately 6 to 7 minutes. Add the lentils, potato, broth, thyme and stir to combine. Increase the heat to high and bring just to a boil. Reduce the heat to low, cover and cook at a low simmer until the lentils are tender, approximately 35 to 40 minutes. Serve with chopped fresh parsley. Serves 6.
thanks for the lentil soup recipe! came out exactly like the mmf !!! really unbelievable! the kids gulped it down with bread dipped in olive oil and balsamic! So glad you liked it. A great recipe to make all winter long….